In an effort to do what we can to answer yours, we have provided the following sections. 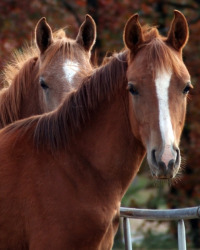 There are Questions and Answers from our newsletter in Ask The Vet, a variety of Handouts that you can read or print, information about the Seminars that Foundation Equine Wellness and Performance presents, the Search Library of articles written by veterinary experts at the Veterinary Information network. Feel free to browse, but if your question is still not answered, call or e-mail us and we will do our best to supply what you need. Foundation Equine is with you every stride of the way!